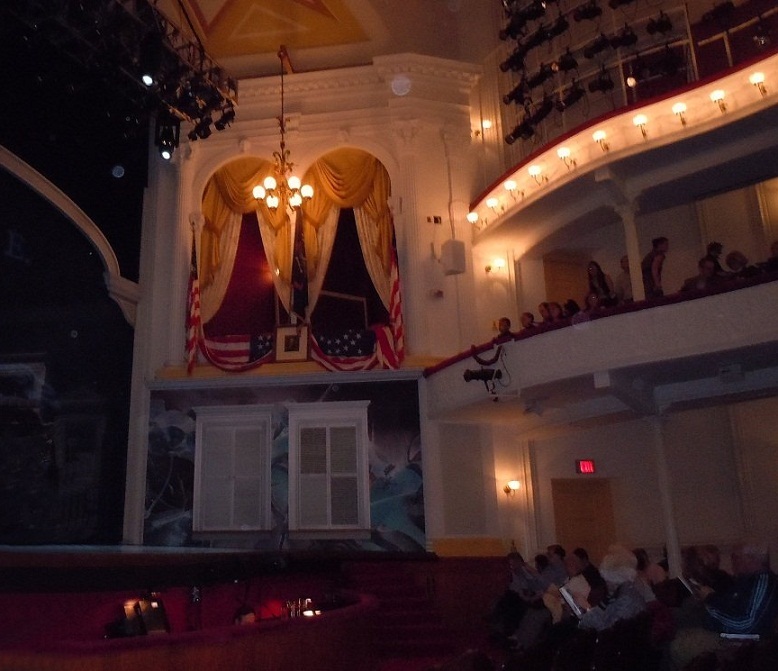 I went to Ford’s Theater last week, to see the musical 1776. The production was a good one, but it’s hard not to break away, every few minutes, to glance up at the Presidential box. Mr. Lincoln still is a presence who won’t be ignored. Friends were surprised that Fords is an active theater. It is. According to its website, it “…produces plays and musicals reflecting America’s rich cultural heritage.” The 2012-2013 season started in September with Fly, a play about the Tuskegee Airmen, included their annual rendition of A Christmas Carol, and rounded out with classics Our Town and Hello Dolly. When I last toured Ford’s, about 30 years ago, there was just a pokey little museum in the basement. The museum in the basement is still there, though considerably less pokey. Mannequins, pictures and artifacts tell the story of the Lincolns in DC. The factoid I learned there: the Lincolns took a carriage ride to the Washington Navy Yard on the afternoon of April 15, to tour the U.S.S. Montauk. After the assassination, the Montauk would serve as a prison for some of the Lincoln conspirators. Cue Twilight Zone music. The museum closes to the public and opens to theater goers one hour before curtain. The audience is funneled into the museum once their tickets are scanned, and you look at the exhibits until a loudspeaker announces that the theater doors have opened. Then everyone files back upstairs to see the show. On the walls of the corridors going up is a timeline – the Lincolns on the left wall, Booth on the right – of how they spent each hour of April 14, 1865, leading up to their meeting at Ford’s theater. The Ford’s Theater experience has expanded recently, beyond the basement museum, into the adjoining building and across the street. The building space next door now is a modern box office, restroom and gift shop area. They also opened an education center across the street, next to the Peterson House, where Lincoln died. The education center houses exhibits on the aftermath of the assassination, including a recreation of the tobacco barn in which Booth was killed. Tickets to the entire site – the museum, the education center and the Peterson house, plus ranger talks and a one-act play – are free, though there’s a $2.50 fee for advance reservations through Ticketmaster. There were none to be had when I tried online, four days before our visit. Ford’s website says they generally run out a week in advance. They hold about 20% of the tickets for same day distribution, but those too were gone by the time we got there. My friend and I fed our disappointment at a restaurant around the corner from Ford’s. The restaurant, Coco Sala, is reviewed separately (short version: it was great!). We got back to Ford’s in time for a quick look through the museum before curtain. The Second Continental Congress was telling John Adams to sit down when I thought I saw movement in the box above us. I looked up quickly, but there was only darkness. There goes that Twilight Zone music again. Gallery | This entry was posted in Washington DC and tagged Fords Theater, heritage travel, Washington DC. Bookmark the permalink.